well the title says it all. alphas (top dogs) go with alphas, omegas (trash) go with omegas. 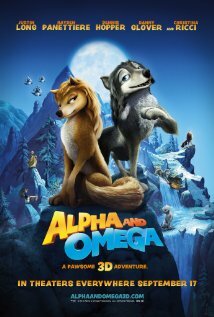 so the story is how alphas end up with omegas, and that it's not so bad, even if it goes against wolf culture. humphrey and kate were not meant for each other, but after they were captured and sent to repopulate idaho's park, their adventure making their way back home changed their way of thinking that alphas and omegas cannot be together. they got some famous ppl to voice the characters, but i dont think it matters much. it's basically an animal cartoon. and the storyline is pretty skimpy.